Snowbird Ski Resort, previously a winner of FTF’s Top 10 Getaways for Tiny Travelers Award, gets a fresh look in 2015. In the canyons that form between the towering peaks of the Wasatch Mountains rising out of the Salt Lake Valley, some of the best skiing in North America can be found. Particularly in Little Cottonwood Canyon, where an average of 500 inches of snow falls yearly, the conditions just don’t get any better. “The Bird” boasts four slopeside lodges, 15 restaurants catering to every palate and pocketbook, several shops, superior ski school and daycare programs, and a full service spa offering cutting-edge holistic treatments and breathtaking views of the surrounding landscape. The International Olympic Committee offered the 2002 downhill event to Snowbird as part of the Salt Lake City games, but they declined, due to the threat the heavy traffic would have imposed on this federally-protected environment. Aside from the expert slopes, the top selling point at Snowbird is the Cliff Lodge, the resort’s premier ski in/ski out accommodation. Conveniently located on its ground floor are all of the day camp and childcare facilities. Camp Snowbird welcomes children ages 5 to 12 with advance registration required. Make sure your children are fully potty-trained and send them with closed toed shoes without heels. Refreshingly, no electronic devices are allowed and the kids swim daily. It’s okay if your kids can’t swim just yet – send along a flotation device. A Teen Camp for ages 13 to 17 are held Monday to Friday and include hiking, science and sports among other fun, action-packed activities. Ski lessons are offered for Chickadees, potty-trained children from 3 years up. Once they get on skis or boards, they head to Chickadee Run, a gently sloping beginner area right next to the Cliff Lodge, each with a dedicated instructor. Parents can watch their toddlers take “first steps” on the way back to the high speed lifts. 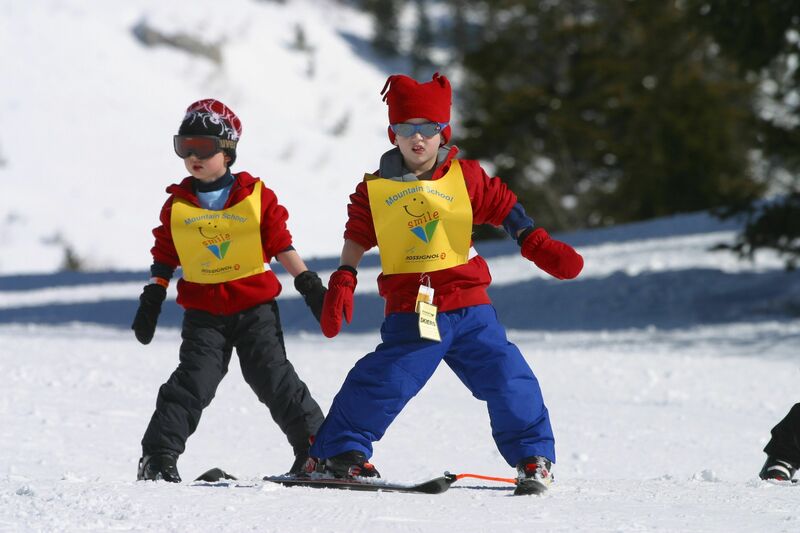 With one instructor for every three skiers, Kinderbirds (ages 4-6) and Mountain Adventurers (ages 7-15) get great training. Snowboard instruction starts at age 7, when this school feels children’s muscle structure and coordination are ready. There’s a special holiday-only program called Wings for Teens that keeps your intermediate skiers and riders (ages 13-17) out of trouble. A special treat for advanced skiers and riders ages 8 and up is the Dawn Patrol. For a fee, Snowbird offers in-room evening babysitters from the center, great for parents who want to check out the live nightly jazz upstairs in the Cliff Lodge, or one of the many lectures on local history and ecology or unwind in the spa’s heated pool and hot tub atop the Cliff Lodge, where they can experience the 360-degree views of snow-capped Snowbird and stars as the sun goes down. Family activities in addition to skiing and snowboarding include free night skiing, a tubing hill, ice skating, snowmobiling, snowshoeing, swimming, ski and snowboard movies, dining, shopping, an adventure lecture series, video arcades, board games, teen holiday parties, and more. Agree that the skiing is absolutely terrific – the tram to the top of the mountain makes this resort absolutely awesome top to bottom. But I think there is one level of skier/rider who would have trouble – the advanced beginner or beginning intermediate. There isn't as much terrain to select for this group. But it's a resort that you definitely have to experience at least once – and you might get hooked and never want to go anywhere else! But I think there is a level of skier / rider who have problems – the advanced beginner or early intermediate. There is so much land to choose for this group. But it is a station that you definitely have to experience at least once – and you can become addicted and never go anywhere else!